For years, Gmail has dominated as the standard — even to the extent that the web savvy crowd tends to think less of people who use a more archaic email service, a phenomenon known as domain discrimination. The rationalization goes, why would you keep using a limited email interface when there’s a better product out there? Along those same lines, your Gmail might be outdated if you haven’t tried some of these handy plugins.Mashable rounded up the best here, which are each available to install as a Chrome Extension, and a few are available on Firefox as well. If you’ve already tried these, tell us your verdict in the comments, and feel free to suggest plugins we might have missed! iMessage and BBM both brought us assurance that others had read (or at least opened) our texts, but what about that hilarious GIF you emailed to your crush? Bananatag now allows you to track opens and clicks on personal emails. For marketers or others who routinely run MailChimp campaigns, these types of analytics are the norm, and they’ve come to expect details on who opens their emails, where they are and on what device. With Bananatag, you’re essentially able to get a read receipt on emails you choose to track (and you’ll also see what links were clicked and the specific time). Although CRM tools offer similar capabilities for salespeople, the founders of Bananatag wanted to make the feature accessible to all, complete with visualizations that make your email interactions very mappable. Your account will continue to log data on emails you track, so you can develop insight into how receptive a contact is to your advances over time. If you access Gmail in a browser window, you’re in the same cloud-centric boat as most people. So, it’s sort of annoying when you click an email link on a “contact us” page, and Outlook or another default mail desktop application automatically starts up. Send from Gmail solves this problem — once installed, it will simply open a new browser tab with a fresh compose email window any time a mail link is clicked. Everyone’s favorite, Rapportive, is unparalleled in revealing the social trail of the people you email. Its Gmail sidebar instantly shows profile pictures and links to Twitter, Facebook and LinkedIn accounts to bring context to your email composing and save you from having to Google acquaintances whom you can’t seem to place. 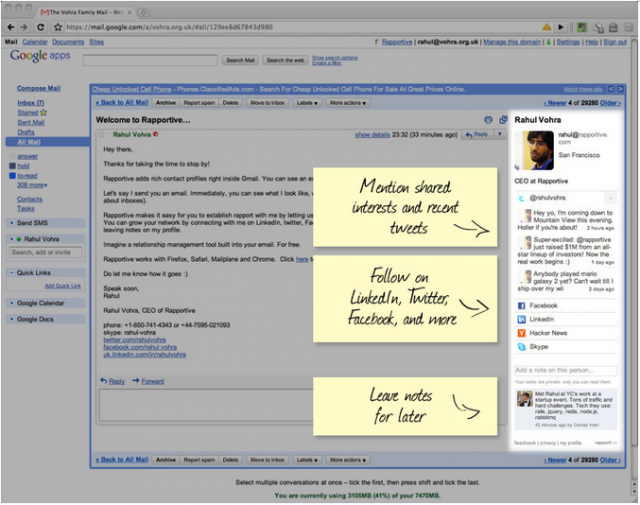 Rapportive also allows you to follow, friend or otherwise add contacts right from the sidebar, without leaving your Gmail window. Every new email is potentially a new task. But, when you’re in the middle of something, especially a creative moment, you can’t pull yourself away to set things in motion. That’s where Snooze comes in. If you’ve opened an email, you’ll see a “Snooze” button — which you can set for any amount of time — and an hour, day, etc. Later, you’ll get what looks like a desktop notification that allows you to either open the email or re-snooze. It’s handy if someone emails you with a question that you don’t have the answer for yet, but will be able to get back to them at a more opportune moment. Mail Timer enables a type of self-taught Pavlovian productivity to keep you on task. If you think you spend too long with email each day, this might be your lifeline. Mail Timer lets you decide how long you want to spend with each email, and once an email is opened, the countdown starts. When time is up, you’ll get a simple pop-up notification that asks you to move on. Just saving 60 seconds per email, per day, for example, can add up to a lot of extra time. Ever wanted an email to hit someone’s inbox at 6 a.m. without having to set your alarm? Boomerang will do that for you. 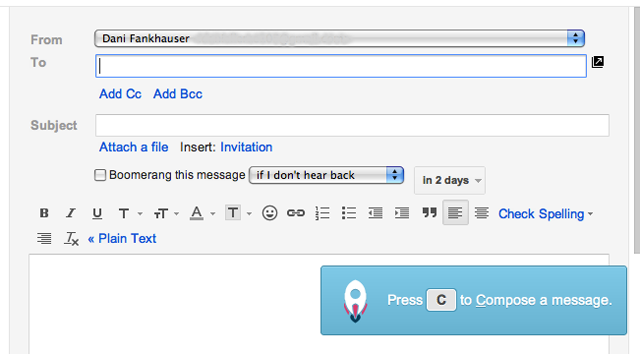 Emails can be scheduled in advance with this handy plugin. 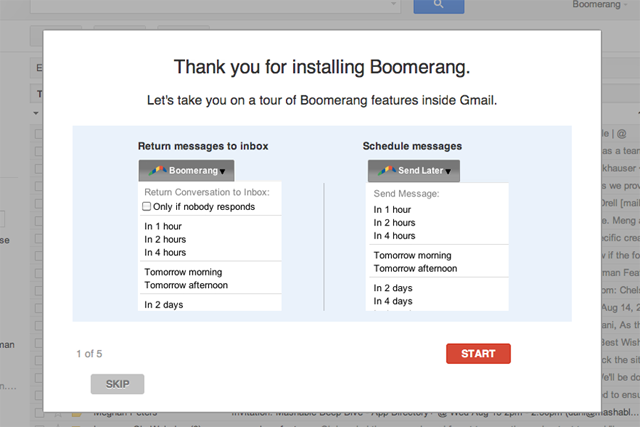 But the feature that got Boomerang its name is the ability to bring a sent email back to your inbox if it hasn’t received a response in a set amount of time. This is useful if you know you’ll want to follow up with someone — you’ll skip having to make a calendar entry and then search for the email, because it’ll magically (well, sort of) appear at the top of your inbox when you need it. Some people don’t know that Gmail has a wide repertoire of keyboard shortcuts — but, these handy shortcuts are only as good as the person who knows them, and who wants to spend a day memorizing keystrokes? KeyRocket is a somewhat annoying, but ultimately useful tool that provides a lower-right corner notification when you click on something you could have keyed. You’ll find yourself learning shortcuts just to get rid of the notification, and soon you’ll be a pro. Attachments.me puts Gmail in tandem with your cloud storage service of choice — Dropbox, Google Drive orBox. Instead of uploading an attachment, you can insert a file from the cloud directly into the email, once you’ve connected your accounts. The plugin also allows you to automatically back up the files you send in your cloud account. If this feature is turned on, every attachment sent from your Gmail account will be saved to cloud storage in whatever folder you prefer. If you’re a list addict, you’ll love Taskforce. Instead of transferring information from an email over to a project management tool, you can just add the email as an entry on your task list, which lives inside Gmail. The task list is fairly non-intrusive and can be moved around. The buttons “Convert to new task” and “Add to existing task” appear right underneath the subject line on an opened incoming email. You can also add tasks independent of your emails, and share tasks with email contacts for use on a team.